CES (Consumer Electronics Show) 2015 will start officially from tomorrow and all the consumer electronics brands are busy setting up their shops at the event in Las Vegas. We’ll see a lot of TVs, entertainment systems, smartphones, tablets, and wearable devices getting launched during the event. LG might launch a high-end smartphone, the successor to the LG G Flex, which was released last year. 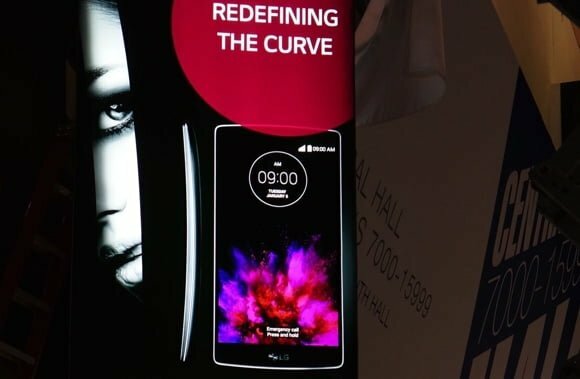 The folks at TheVerge have spotted posters of the LG G Flex 2 on the CES show floor. As you can see from the images, LG has retained the curved screen and the bendable design of the original G Flex. However, we expect that LG will bring significant improvements to its hardware and software. The device seems to have minimal bezels and a sharper screen when compared to its predecessor. We can also see that the G Flex 2 runs LG’s new software UI, which is flatter and more streamlined. Earlier this week, Qualcomm had teased an image of an upcoming smartphone, which is expected to be announced during CES 2015 and is powered by a Snapdragon 800 series chipset. We think that Qualcomm was referring to the LG G Flex 2 powered by either a Snapdragon 801 or a Snapdragon 805 processor. LG has also released a video teaser of the products, which the company will showcase during the CES 2015. This video teases the presence of the LG G Flex 2, Bluetooth headphones, TVs, and more.